This year we are delighted to announce a special guest pianist by one of our own, Mike Barclay of ITG Canada. Mike will be playing the piano during our Friday night Opening Cocktail Reception. Many of you may have seen Mike on the piano before, whether on the stage, or at an impromptu industry gathering. 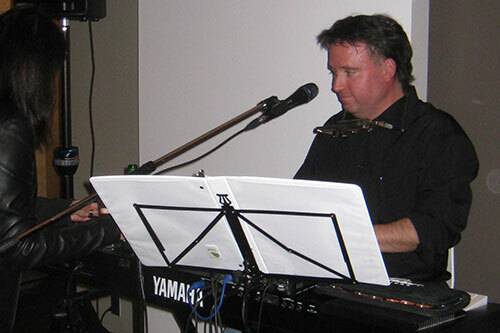 He has twenty years of industry experience but even more than that at the keys. Mike’s musical experience began playing classical piano at the age of 4. He’s played professionally for a bit, and has dabbled in song-writing. Florida has approximately 1.5 million veterans spanning from WWII to the wars in Iraq and Afghanistan. While many of these veterans successfully transitioned to a post-military career, some face challenges to living a happy and productive life. Major issues faced by Florida veterans include access to healthcare and benefits; housing; jobs and unemployment; post-secondary education; depression, post-traumatic stress disorder (PTSD); traumatic brain injury (TBI); substance abuse; and suicide prevention. The philosophy of the Florida Veterans Foundation is to leave no veteran behind. This is only possible through the monetary contributions, goods and services we receive through donations and fundraising. Thank you for your support of our nation’s heroes. STA Florida is proud to announce the launch of a new photo gallery that will highlight the organizations annual conference events. Visit the new gallery page to see photos from the 2015 Annual Conference. STA Florida and the STA Florida LatAm Launch Committee hosts Happy Hour in NYC to raise awareness of the effort to launch a STA LatAm affiliate. The venue SOAKED, on the rooftop of the Mondrian SoHo Hotel (9 Crosby St. NY,NY 10013) was selected for Sunday’s Happy Hour Event, which takes place June 23rd to begin at 5 p.m.
For those of you that are coming from out of town, SOAKED does not serve food, so please be sure to grab a bite to eat before you arrive. We are using this opportunity to introduce the Securities Traders Association (STA) and discuss the benefits of having a STA LatAm affiliate. Jim Toes, CEO & President of STA will be in attendance for the introduction as well as to answer any questions that you may have. Please be sure to help us thank the organizers for this Happy Hour: STA, STA Florida LatAm launch committee, Alice Botis of Fidessa and Zabi Fazal of Ullink, both NYC. STA Florida has been working diligently at helping to launch this new affiliate and this year formed the STA LatAm launch committee, please help us thank the members. Alice Botis, Director of New Sales, Latin American Business Development, Fidessa Corporation, NYC. Alan Gandelman, Chief Executive Officer of ATS Brasil (company owned by NYSE and ATG) since December 12, 2012, Brazil. Alan is also the STA LatAm Affiliate launch Committee Chairman/Head of STA LatAm Affiliate once launched. Alejandro Rebelo, SVP for LatAm Sales & Trading, INTL FCStone Securities Inc., Miami, FL. And Head of STA LatAm Brazil effort. Tony Varela, Vice President/Securities Trading, INTL FCStone Securities, Inc., Boca Raton, FL. William W. Cooper, Senior Equity Trader, State Street Global Markets, Boston, MA. Jake Rappaport, STA Florida Board Member, Managing Director and Head of European and LatAm Trading, INTL FCStone Securities Inc., Winter Park, FL. Also, please help us thank Daniel Jose Somuano, Managing Director of Interacciones who will head the STA LatAm Mexico effort.